The Drive Head models tabulated below are compatible only with the Model Si-8 hydraulic torque wrench product line having 8,000 ft-lb capacity. These are provided as a reference in understanding how to purchase the Model Si line of wrenches, which offers models with capacities ranging from as little as 300 ft-lbs up thru 200,000 ft-lbs of torque. Please contact our Sales department for information on the complete line of Si wrenches and Drive Heads pertaining to each specific model. Any of the Model Si-8 Drive Heads listed below can be furnished with your choice of (inch or metric) hex sockets within the given size range specified for that Drive Head. Please note that one socket is needed for each different hex size required for your application, to be changed out similar to impact sockets. 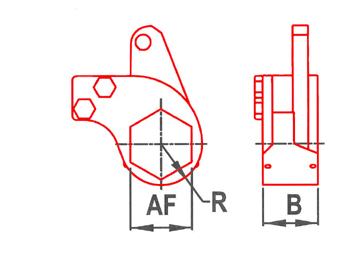 Selecting Drive Heads and Sockets should be based on consideration of both required torque and radial clearances around the bolt heads which are to be torqued. For example, if radial clearances around the bolt heads are close, choose a separate Drive Head with adequate torque capacity for each size hex. If radial clearances around the bolt heads are NOT close, then choose a Drive Head with adequate torque capacity for the largest bolt to be tightened, and then specify the individual socket sizes needed for each hex nut or bolt. 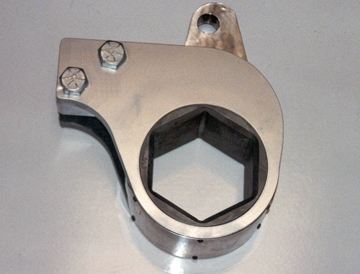 The sockets in the Drive Head can be changed out similar to impact sockets. For added versatility, you can also convert the Model Si torque wrench into a square drive wrench which can be used with standard impact sockets by ordering a Model SDH drive Head. Contact our sales department for details. In addition to 6-point hex sockets, we can also furnish 12-point hex sockets, octagon, and military spec spline drives sockets.